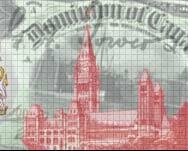 In 1967, the Bank of Canada issued special $1 notes to commemorate the centennial of Confederation. The face of the note resembles that of the 1954 $1 issue, except for the maple leaf centennial symbol at the left and references to the centennial along the top and bottom. The back vignette portrays the original Centre Block of the Parliament buildings, which was destroyed by fire in 1916. The same vignette was used on the face of the 1872 $100 Dominion of Canada note. A specimen note is one which is genuine, although not negotiable, with no serial number or a serial number consisting solely of zeros, with one signature or no signature, sometimes with holes punched through the signature positions and sometimes overprinted or stamped "SPECIMEN". Specimen notes are often distributed to banks and other institutions at the time of the introduction of a new issue as an aid in recognizing the new notes and in detecting counterfeits. In two public auctions (one in 1999 and a second in 2000), the Bank of Canada made available quantities of specimen notes which were surplus to their operations. There were two types of 1967 series $1 notes. The first, specially for collectors, was available only from the Bank of Canada but quickly made its way into circulation. These notes have the dates "1867 1967" in place of a serial number. There were 12 million of these notes printed, but they were widely hoarded by the public and so they are expected to remain very common for many years and in high grades. The second type of 1967 series $1 note was the one intended for circulation. Deliveries of the 1954 series $1 notes to the chartered banks were suspended through 1967, and the commemorative notes were distributed exclusively. These circulation-issue $1 notes had serial numbers on them like the 1954 series $1 notes. Two groups of circulation notes were printed, one by the Canadian Bank Note Company and the second by the British American Bank Note Company. In total, approximately 127 million circulation-issue $1 notes were printed, but they have disappeared to a greater extent than the collectors issue notes.